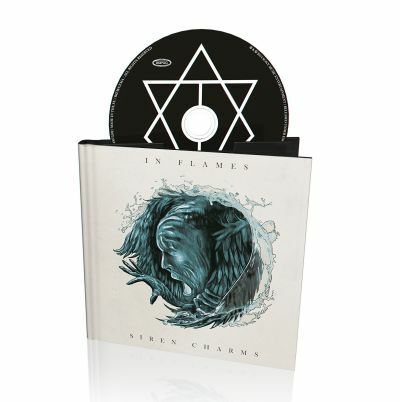 IN FLAMES - SIREN CHARMS LTD. EDIT. (DIGI-BOOK) | Online Shop | Wizard LTD. Album: "SIREN CHARMS LTD. EDIT. (DIGI-BOOK)"
The new album entitled Siren Charms will be released internationally in September 2014. This is the 11th studio album from In Flames, recorded in December 2013 at Hansa Studios in Berlin. The album was produced by Daniel Bergstrand, Roberto Laghi and In Flames, mixed by Michael Ilbert at Hansa Tonstudios, and mastered by Tom Coyne at Sterling Sound, NYC. Siren Charms aims to continue on this success with 11 tracks offering blistering metal anthems such as "Rusted Nail" and "Filtered Truth." This album marks a turning point for the band as they move towards a more accessible sound while still maintaining their hard-earned rock credentials.